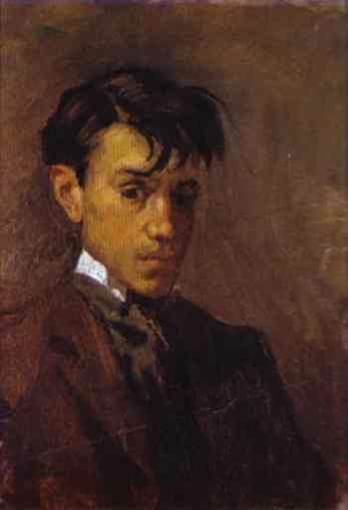 Pablo Picasso (1881-1973) painted this self portrait, while looking in a mirror, when he was only 15. 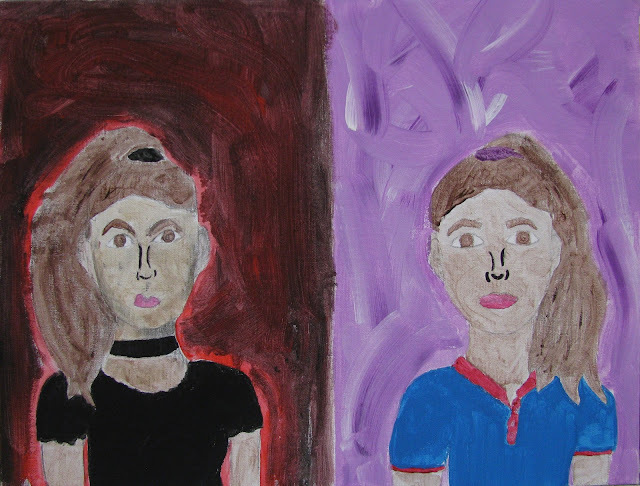 What can you tell about the teenager in this painting? What can you tell about him from his clothing and hair style? What about the expression on his face? Are the colors in the picture cool or warm? In 1895, when he was 14 years old, Picasso’s 8 year old sister became very ill. His mother told him to pray for his sister because she might die. That night when he said his prayers, he promised God that if He would only let his sister live, Picasso would give up the things that he loved the most. He promised God that he would never draw or paint again if only Conchita could live. 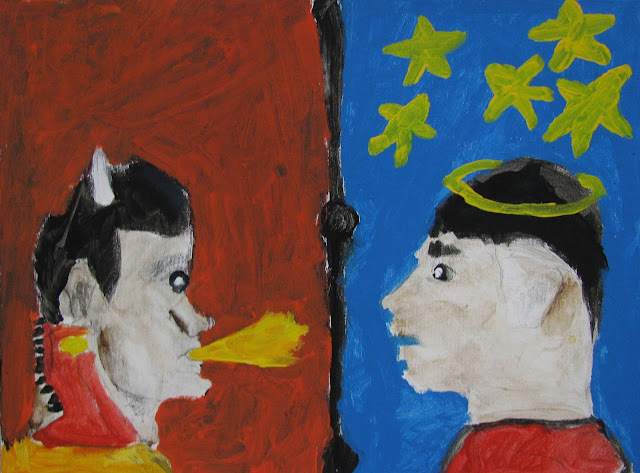 When Conchita died, 14 year old Picasso felt that it was his own fault. But he also felt that God wanted him to continue to create art. 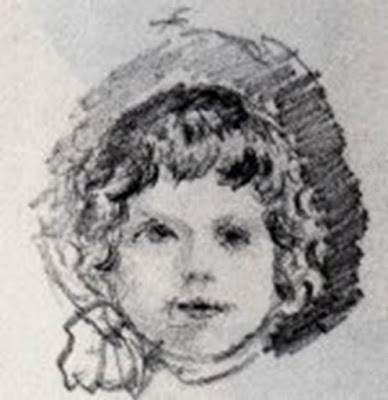 Picasso drew this picture of Conchita when she was eight and he was 14, before she became ill. You can see the thoughtful, serious expression of a young man who has known pain when you look at the 15 year old Picasso’s self portrait. His clothes and hair show a well taken care of teen but his expression is thoughtful and sad. This is another self portrait by Picasso. He painted it in 1901, when he was 19. What do you notice about the young man in this picture? What colors did he use? What do you notice about the expression on his face? What might have happened to cause Picasso to feel this way? Pablo Picasso created this memorial painting, The Death of Casagemas, in 1901 in Paris, when he was 19. Casagemas had been Picasso’s best friend. They had travelled to Paris together with the ambition of becoming famous artist but times were difficult. Their apartment was cold and drafty and they did not have enough money for food. Notice the hollow cheeks in the blue self portrait in the previous slide. Casagemas fell in love with a beautiful girl but she did not care for him and liked Picasso instead. In despair, Csagemas killed himself. Once again, Picasso felt that he was responsible for the death of a loved one. 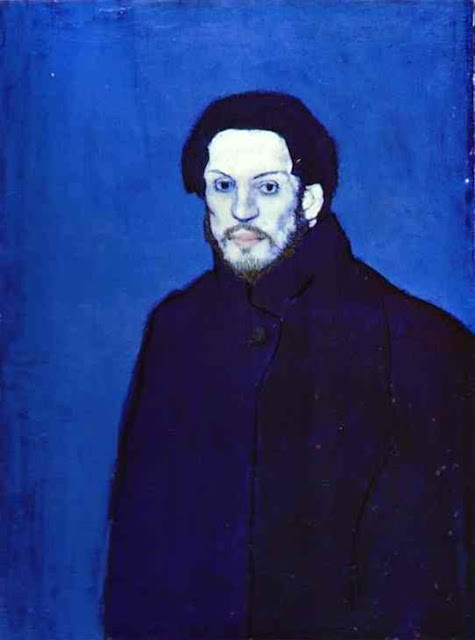 The blue pallor of Picasso’s skin and grim look on his face reflect his feelings. 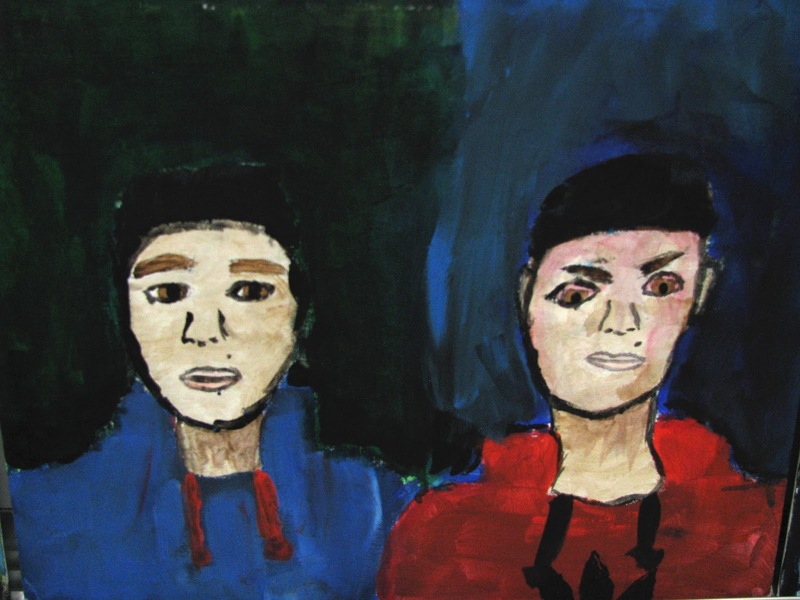 The portrait depicts a man who has lost his best friend. 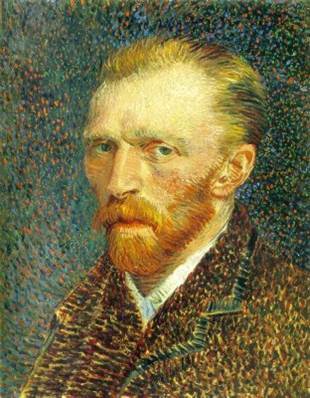 Vincent Van Gogh (1853-1890) painted this self portrait in 1887. Van Gogh painted this self portrait in 1889. 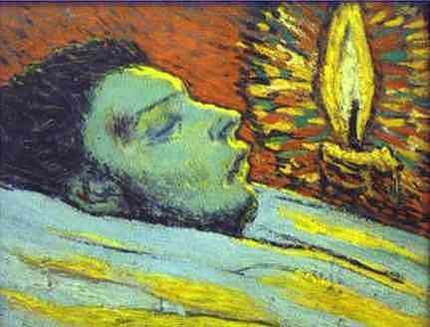 Ten years after Van Gogh’s death Picasso saw his paintings in Paris. 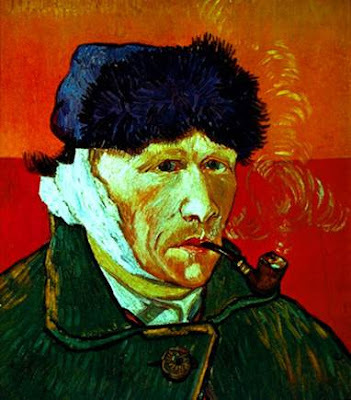 Van Gogh’s paintings were revolutionary. He was the first painter to use color to express emotion. 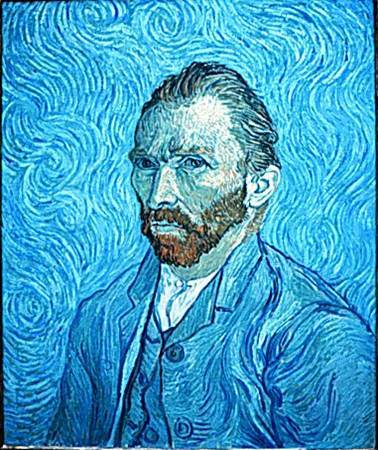 Van Gogh painted this self portrait shortly after the blue one. Compare the serious, sad thoughtful look in his eyes to Picasso’s 15 year old painting. 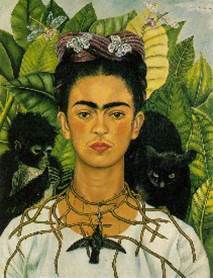 This is a self portrait by the Mexican artist Frida Kahlo. Notice how she emphasizes her eyebrows in this picture. What does the shape of her eyebrows look like? She painted her eyebrows in the shape of a bird on purpose. She was disabled in a very bad bus accident as a young woman and drew her eyebrows like that to symbolize her dream of being, like a bird, free from disability and pain. Because of this accident she was also unable to have children. Every time she got pregnant she miscarried. 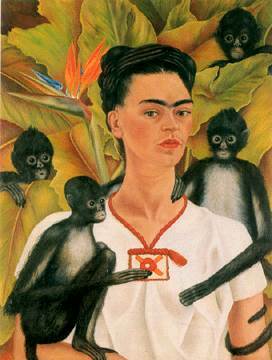 She kept many pets, including these spider monkeys. She loved them and took good care of them. To her they symbolized the children she could never have. 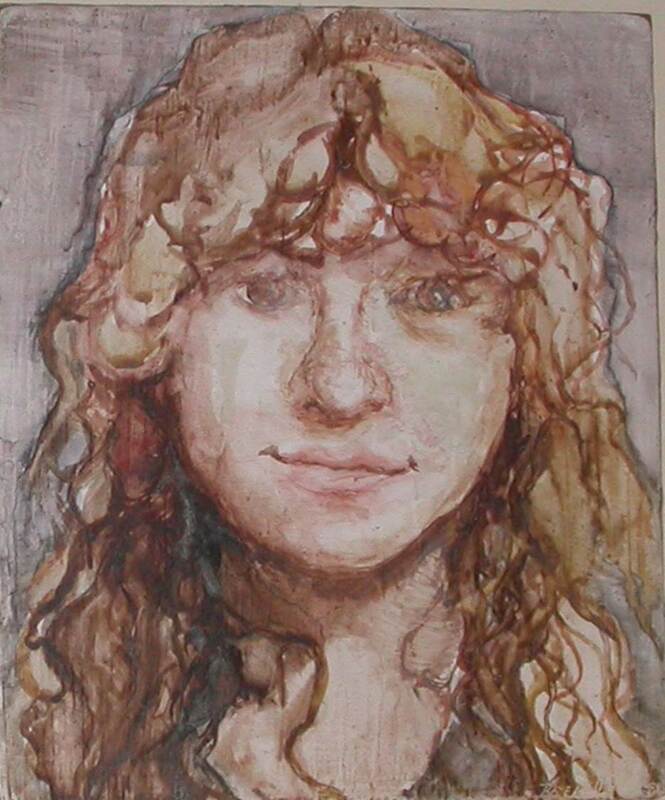 Here is another self portrait by the same artist. Using a dry eraser marker and a piece of plastic, try closing one eye and practice tracing the features of a friend's face. Next, use a mirror and try to trace the features of your own face. Practice making different facial expressions with your mouth and eyebrows to express different emotions. 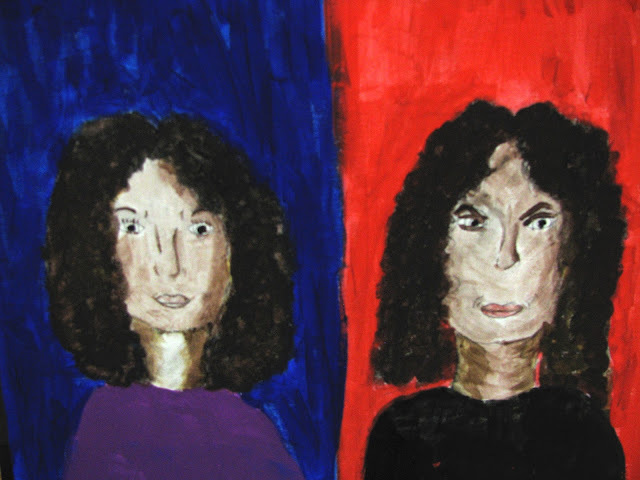 You can see by the self portraits of the artists that I have shown here that the same person can look completely different depending on how they are feeling and what they are going through in their lives. 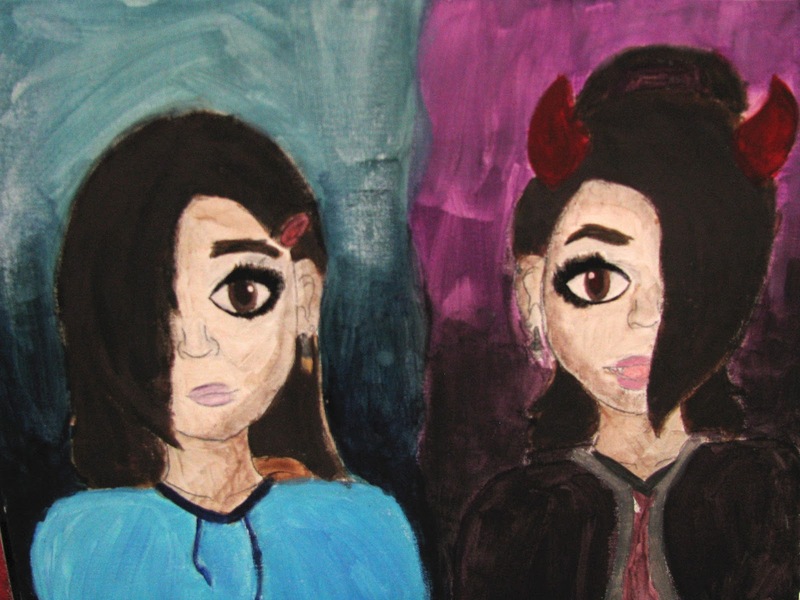 The assignment below was inspired by a lesson written by Eric Gibbons called 'My evil twin.' To see Mr. Gibbons lesson please click here. Your story’s main character will be loosely based on you. That means that it will be written in the first person (using the pronoun ‘I’). The character can be older or younger than you, even grown up. They can have a completely different life than you. They may also have a different name than you. But their personality and how they would act in imaginary situations should be based on you. They must be human. Your story must have a setting. It could be anywhere, real or imaginary, past, present or future. 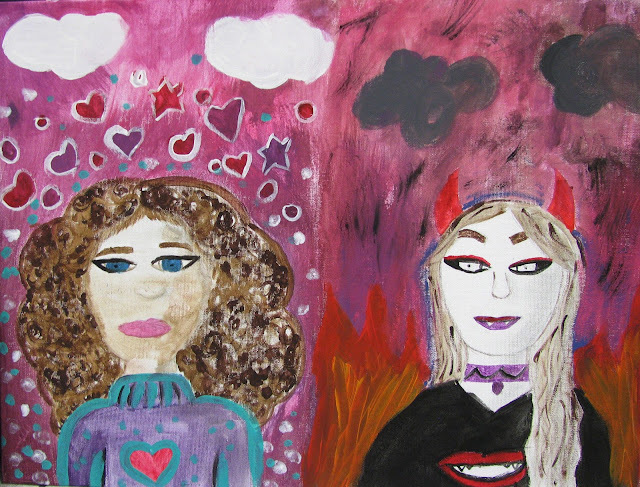 Your character must have an evil twin that tries to ruin his or her life by pretending to be them. Be as original and creative as possible. 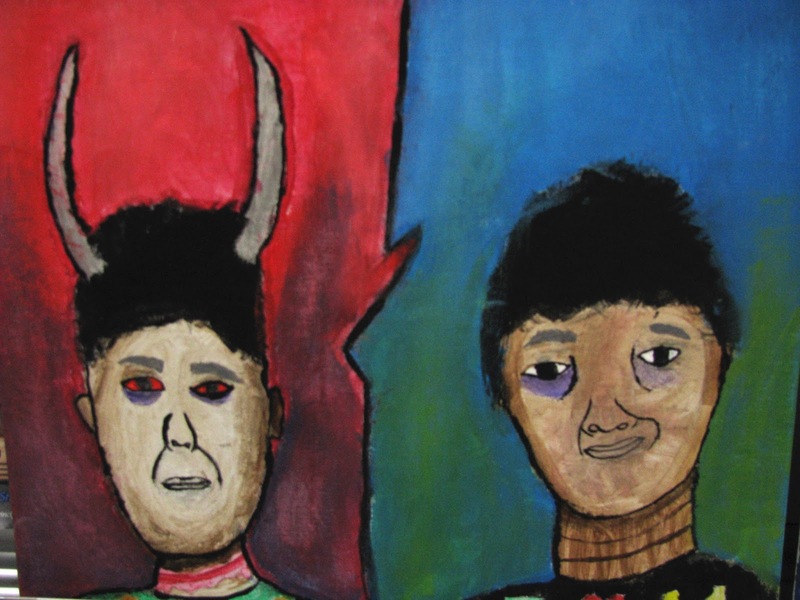 What are some ways an evil twin could potentially cause you problems? The ‘twin’ does not need to be related to the main character. They merely have to look identical to them. They could be an actual twin, a clone, a cyborg, a time traveler, a relative or just a doppelganger. However they must be able to get away with impersonating the main character, at least for a while. How does the main character try to solve their problem? Does anyone believe them? Can they expose the evil twin? Your story must end in a cliffhanger. Think of the season finale of your favorite TV show, where you have to wait until next season to find out how it ends. Keep your readers interested. Does your main character get the happy ending they deserve? Or is all lost? Keep your audience guessing. 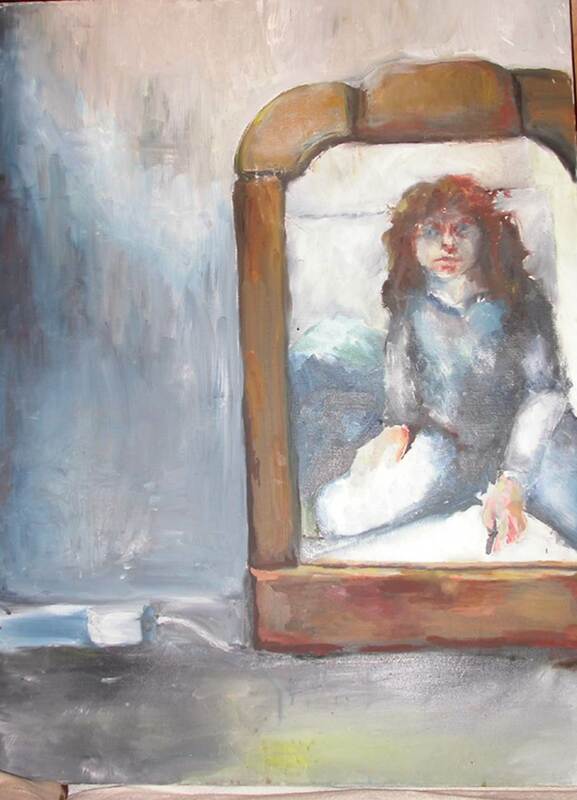 For the backgrounds, I referred back to the famous self portraits we had looked at earlier. 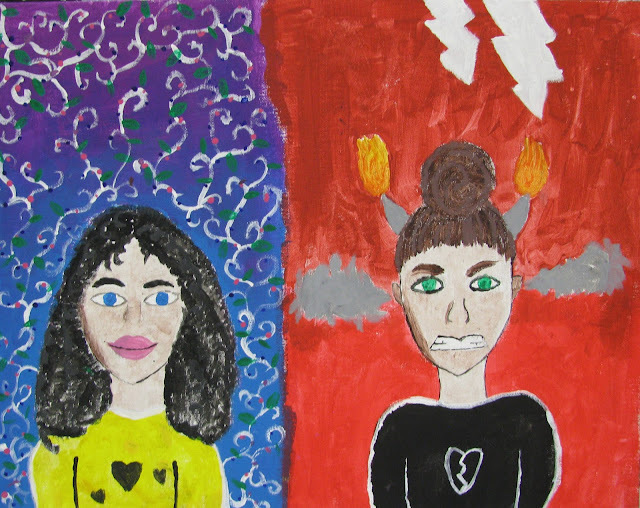 I told them the most important choice they had to make for the background was to use color to expressed the emotion they were trying to convey. 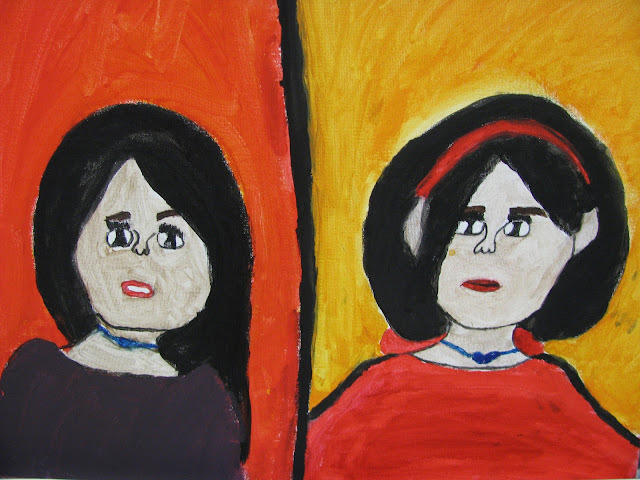 We discussed how many artists used a solid color field, how Van Gogh used brush strokes to express emotion and how Frida Kahlo used very detailed backgrounds that were part of the autobiographical narrative of the picture. I left it up to the individual student to decide how to approach the background, my only stipulation being that the color reflect the mood of the painting.